Ahoy! Fun on the horizon. A way for young pirates to steer their ship! Batten the hatches, it’s time for fun! The Ships Wheel turns their play fort into a sailing ship and him or her into a captain or pirate. This play ships wheel has the look of a classic ship wheel yet is made of ultra durable weatherproof Polyethylene. They will be happy pretending to sail the seven seas. You’ll be happy that this fort accessory includes mounting hardware and cap cover. Wheel makes clicking sound as it is turned. 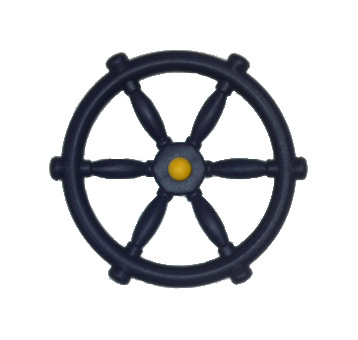 11″ diameter, plastic ships wheel with mounting attachment. Set sail on the high seas!